The wind dries the water spat onto the cold, grey trees by the waves to a salty brine as the sun heats the island already choked by heat. There are few trees here, as the island has been burnt through by fire and buried by floodwaters many times before. Fortunately for the animals which still cling to the isle, the ground shines green with flowers, moss, and ferns. Herds of dwarfed lambeosaurs traverse the land, scraping off the greenery from the pale earth. At their feet, coelurosaurs dash to and fro, eating insects which have been disturbed by the grazing hadrosaurs. Little dromaeosaurs, bearing distinct sickle claws, prowl the wilderness alone. The small size of the island prevents them from forming packs, in which competition would kill the feathered dinosaurs. Alone, they must be cautious, as larger predators stalk this island of dwarfs. Abelisaurs, short armed and blunt-headed carnivores, lie in wait next to water holes. These ten foot long killers are among the largest animals of the island, and are most easily able to bully dromaeosaurs away from kills. As a herd of hadrosaurs stops to drink, an unfortunate male is spotted by an abelisaur, which, like a bull, charges and rams into the hadrosaur. Dazed and bruised, the hadrosaur bellows for its herd, but all other dinosaurs have fled the scene in panic. The abelisaur continues to attack, finally forcing the hadrosaur down to the rugged ground, where it dies. The abelisaur barely gets a nibble of the hadrosaur carcass when a loud trumpeting sound is heard from the tree. Out of the blue bursts a theropod, though it is unlike the dromaeosaurs and abelisaurs of the island. 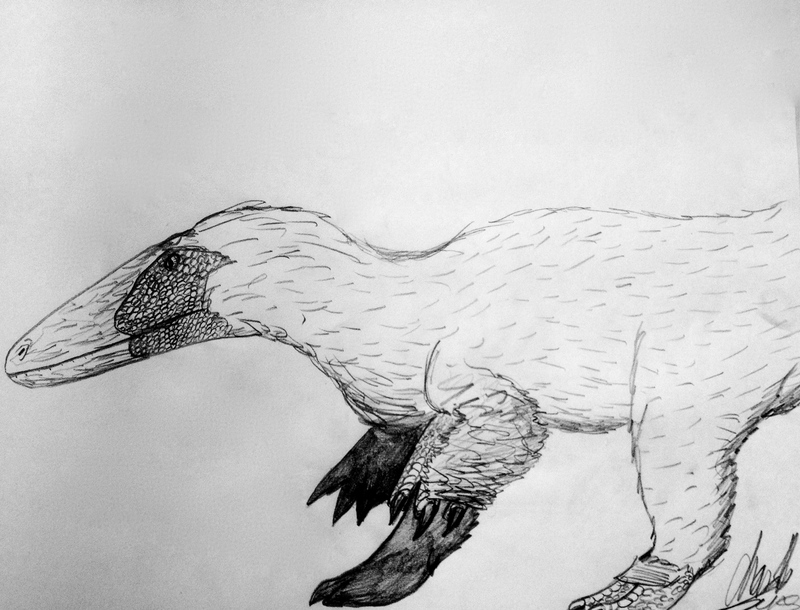 It is a Betasuchus, a relative of tyrannosaurids. The theropod lunges at the abelisaur with its claws, its dark feathers trembling in the wind. The abelisaur, gored by the feathered theropod, trots away. If the wound becomes infected, the abelisaur may die. During the Cretaceous, Europe was reduced to scattered islands surrounded by tempestuous seas filled with whale-sized predators. Where France and Germany now are, ocean allowed but of few nesting grounds for terrestrial organisms. Limited ground meant that animals dependent on dry land could only get so large, dramatically changing the evolution of European Cretaceous dinosaurs. To the east, fossil remains from dinosaurs of Hateg Island provide remarkable glimpses into a world of miniature sauropods, tiny ornithopods, and gigantic pterosaurs. To the west, the remains of abelisaurs, such as Tarascosaurus, as well as those of dromaeosaurs, such as Pyroraptor, have been discovered. Looming in the ocean depths surrounding these islands were mosasaurs, giant marine squamates which hunted the abundant fish, invertebrate, and marine reptiles of the Cretaceous. These giants are well known from the Netherlands, where the type specimen of Mosasaurus hoffmannii was unearthed from a quarry in Maastricht. Nearby, a more obscure predator left but one reminder of its existence. A partial femur, named Megalosaurus bredai, was described in 1883, and would be the first terrestrial Maastrichtian vertebrate known to science (Seeley, 1883). The name of the animal would later be changed to Betasuchus bredai (Von Huene, 1932). There has been confusion over what type of theropod dinosaur the femur belongs to. It has been found to be from an ornithomimosaur, or “ostrich dinosaur” in a few studies (Von Huene, 1926)(Russell, 1972). 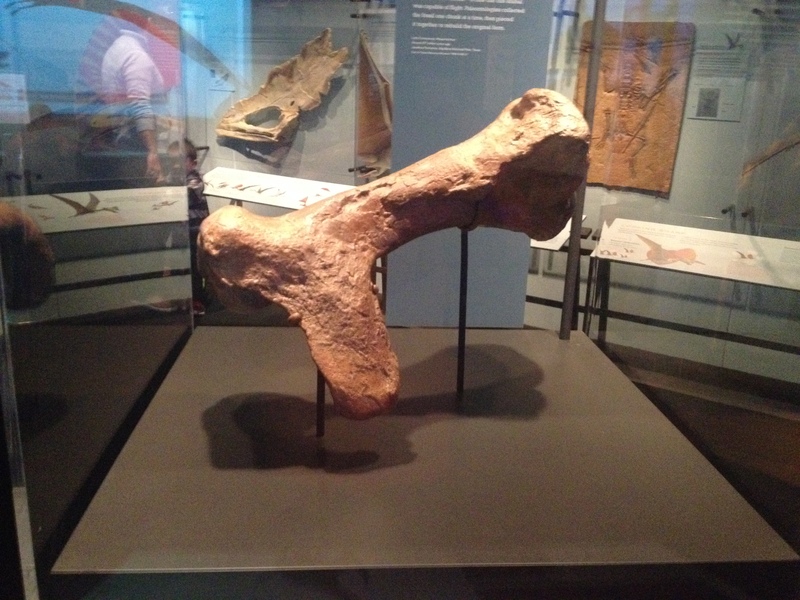 However, the femur has also been considered to have come from an abelisaur (Loeuff & Buffetaut, 1991)(Tykoski & Rowe, 2004). Abelisaurs were large predators of Europe during this time, with forms like Arcovenator appearing in France (Tortosa et. al., 2013). The skull of Majungasaurus, an abelisaurid dinosaur. Photo by the author, 2015. Perhaps the most interesting classification of this animal has been as a relative of the Appalachian tyrannosauroid Dryptosaurus (Carpenter et. al., 1997). This classification, if true, could have implications for the origin of Dryptosaurus aquilunguis and other Appalachian tyrannosaurs like it. It would also paint a different picture of Betasuchus as a dwarf version of the 8 meter Appalachian predator, using large claws on its forearms as well as slicing teeth for handling prey. The ecology of Betasuchus is just as obscure as the animal itself. However, a possibly diverse fauna of hadrosaurs from the Cretaceous of the Netherlands and northern Belgium. Two possible distinct lambeosaurine taxa, as well as a possible euhadrosaurian, may have lived alongside Betasuchus (Jagt et. al., 2003). An abelisaurian or dryptosaurian Betasuchus would likely have preyed on these hadrosaurs. Dromaeosaurs may have also existed alongside Betasuchus, as the group was present in Europe during the Late Cretaceous (e. g. Allain & Taquet, 2000). This is the partial leg of a juvenile Corythosaurus casuarius, a lambeosaurine dinosaur. Photo by the author, 2015. Betasuchus bredai evinces the obscurity of some of the earliest known prehistoric vertebrates. The only known specimen, a partial femur, is a hint at an ancient island ecosystem where hadrosaurs roamed, pterosaurs stalked, and theropods hunted. Betasuchus bredai by the author. Colored pencils on paper, 2015. Seeley, H. 1883. “On the dinosaurs from the Maastricht beds.” Quarterly Journal of the Geological Society of London 39: 246-253. Von Huene, F. 1932. “Die fossile Reptil-Ordnung Saurischia, ihre Entwicklung und Geschichte.”Monographien zur Geologie und Palaeontologie 4: 1-361. Von Huene, F. 1926. “The carnivorous Saurischia in the Jura and Cretaceous formations, principally in Europe.”Revista del Museo de La Plata 29:35-167. Russell, D.A. 1972. “Ostrich dinosaurs from the Late Cretaceous of western Canada.” Canadian Journal of Earth Sciences 9: 375–402. Loeuff, J. & Buffetaut, E. 1991. “Tarascosaurus salluvicus nov. gen., nov. sp.,dinosaure théropode du Crétacé supérieur du Sud de la France.” Geobios 24 (5): 585-594. Tykoski, R.S. & Rowe, T., 2004.”Ceratosauria.” In: Weishampel, D. B.; Dodson,P. ; and Osmólska, H. (eds. ): The Dinosauria (2nd Edition) Berkeley: University of California Press. pp. 47-70. Carpenter, K.; Russell, D.; Baird, D.; Denton, R. 1997. “Redescription of the holotype of Dryptosaurus aquilungis (Dinosauria: Theropoda) from the Upper Cretaceous of New Jersey.” Journal of Vertebrate Paleontology 17: 561–573. Jagt, J. W. M.; Mulder, E. W. A.; Schulp, A. S.; Dortangs, R. W.; Fraaije, R. H. B. 2003. “Dinosaurs from the Maastrichtian-type area (southeastern Netherlands, northeastern Belgium).” Palevol 2: 67–76. Allain, R. & Taquet, P. 2000. “A new genus of Dromaeosauridae (Dinosauria, Theropoda) from the Upper Cretaceous of France.” Journal of Vertebrate Paleontology 20: 404-407. EDIT: The Welsh theropod has been given the scientific name Dracoraptor hanigani and formally described. You can find the paper here. Dawn, and the trees seem to crack as the harsh, dry light of the morning rests upon their crumbling bark. The woods are silent except for the slight sound of leaves being blown over by the wind. However, the silence is misleading, for in the crevices of this bleak landscape, life still clings on. A soft sound is heard, revealing the presence of one animal. The sound comes from the shoreline, where the woods give way to rocky coast and wispy seas. The animal making the sound is a theropod dinosaur, encased in a fluffy coat of feathers for insulation. The animal is small, only a few meters in length, but in this wintry land size is irrelevant to survival. Only the hardy remain in these woods. The land is frequented by storms which blot out the sun and cause flooding. The chilly waves of these surges almost freeze the landscape, drowning plants and animals and seizing trees for the sea. The trees that do survive are sickly and old. They survive only by their sturdiness. The theropod takes advantage of the old trees, scratching the bark in search of grubs. It might seem as though this dinosaur is eking out a living, but the theropod is in fact very much content with her grub-devouring lifestyle. Her cheerful disposition is soon broken as another animal of her species bursts out of some nearby bushes and runs towards her. This new animal has a scar across his jaw, seemingly from a previous confrontation. The scarred one leaps toward the other theropod, which in turn runs up a hill to a cliff. The scarred theropod follows and almost manages to rip off the end of the fleeing theropod’s tail. As the scarred one reaches the outcrop, he jumps at the other theropod, but misses. The scarred theropod falls off the rocky outcrop and is sent tumbling down the hill, breaking bones. The scarred one limps off, collapsing soon after. As for the other theropod, a few scratches line her face. Although the fight sent a shot of adrenaline through her body, she goes on about her day as if nothing happened. Such is life in the woods which will one day become Wales. The Welsh theropod is known from fossils found at Lavernock beach in South Wales. The fossils themselves are extremely precious as the sediment from which they were retrieved usually produces little more than fish teeth. The story of the collection of the theropod fossils themselves is one of luck. In 2014, Nick and Rob Hanigan were scouring the beaches for fossils when one of them came upon a block containing some of the Welsh theropod’s bones. Soon, both located some more fossil elements and the partial skeleton was retrieved from the beach. It is highly likely that if the brothers had not spotted the fossils on the day they were out on the beach, the bones of the Welsh theropod would have washed out to sea and never collected. The Welsh theropod is particularly important in terms of when it lived. The rocks its bones were encased in were deposited during the Early Jurassic period, a time when dinosaurs were just starting to become the masters of the land. After the Triassic extinction event, surviving tetrapods such as the dinosaurs and the pterosaurs had the room to diversify. However, comparatively little is known about the dinosaurs which lived during this pivotal age in Earth’s history. The Welsh theropod therefore is greatly important to our understanding of the evolution of dinosaurs during this time (especially theropods) and the changing ecology of theropods as well as other dinosaurs in worldwide ecosystems. Overall, the Welsh Theropod provides a key glimpse into a time when the dinosaurs were greatly diversifying. The animal’s story is one of luck, both good and bad, which saw its body drift to the bottom of an ancient sea, only to be discovered 200 million years later by two men perusing the shore. This aspect of luck denotes the very time the Welsh theropod was living in: one where the rule of land had become the prize of an evolutionary contest and the theropods were learning how to play their cards right. Information was taken from this post on Everything Dinosaur as I am not aware of any scientific paper on this animal yet. *Note: I promise I’ll write about an actual tetanuran next time. I was very fascinated by this particular animal, so I felt the need to share that interest with others. Thanks for reading, and happy holidays! The rising sun adds a warm ambience to the crisp morning. The forest wakes from its slumber as its inhabitants begin a chorus which will last until the evening. Yet this tune lacks the happy calls of birds, which do not yet exist. Their ancestors do, however, live in these woods, and just like the sun at dawn, they themselves are rising in stature among the trees. Among the bird relatives present in these ancient Early Jurassic woodlands are podokesaurs. These nimble predators, which can reach 10 feet in length, are a common site. Males of this species produce a distinct grumbling sound using a bright-blue colored throat sac. Females, which usually are larger then males, bear brown, black, and gold scales. Podokesaurs are social animals, and form large flocks during the wet season when food is plentiful. In this way, they are able to coexist and find mates will little difficulty. Males rarely engage in physical confrontation to win over females. Instead, each male tries to produce a grumble louder than their competitor. The victor wins over the female, and the loser must look somewhere else for a mate. During the dry season, podokesaurs roam in small family groups composed of a mating pair and their offspring. Podokesaur chicks instinctively ride on their parents backs during long journeys, and only start to walk for long periods of time themselves when they are around a year old. The goal of these “dry-season treks” is to find an area where water is still present, which is extremely hard to do given that the podokesaurs live in the rift valleys of the Early Jurassic Northeastern United States. Here, sun beams stab at the gaunt cliffs and flat woodlands that the podokesaurs live in, cracking the ground and burning the trees. The wet season brings monsoons, and a single one of these can cause widespread flooding and rockslides, which can wipe a valley bare of trees and animals. For those which survive this natural lottery, the monsoons bring much-needed water to parched rivers and lakes. In a single day, a dusty grove of conifers can turn into a bog, and a clearing into a delta. The podokesaurs exploit this, using their long necks to sneak up on and grab invertebrates and fish, such as the coelacanth Diplurus. They are joined by prosauropods like Anchisaurus and larger carnivorous dinosaurs like Eubrontes. In some cases, podokesaurs mob an unlucky prosauropod, causing death by bloodloss and exhaustion. However, the podokesaurs must be wary, as their prosauropod contemporaries are armed with hand spikes which can sever arteries and pierce eyes. The vast flocks of podokesaurs which form during the wet season are also an omen of death for some. Often, a podokesaur is trampled by others of its kind, and left to die on the side of a riverbed. Now, the skeletons of these fallen predators are being discovered, and provide a glimpse into their incredibly interesting lives. Podokesaurus holyokensis is an enigmatic species of small carnivorous dinosaur from the Early Jurassic of the Eastern United States. Originally described by Mignon Talbot in 1911 (Talbot, 1911), and has been classified as a coelophysoid dinosaur (Tykoski & Rowe, 2004). In fact, Mignon would be the first woman to describe a non-avian dinosaur (Turner, Burek, & Moody, 2010). Podokesaurus means “swift-footed lizard”, a name fitting for a small, gracile theropod dinosaur. Like other coelophysoids, Podokesaurus was a predator of small animals, preying on anything it could fit into its mouth. Podokesaurus was most likely also a scavenger, feeding on the kills of larger Connecticut Valley predators such as the large theropod dinosaur Eubrontes giganteus (=Dilophosaurus?). Cast of the holotype of Podokesaurus holyokensis on display at the Peabody Museum. Photo by the author, 2015. Although the holotype of Podokesaurus suggests that it was an extremely small theropod at only 3 feet in length and 1 foot in height, a second referred specimen (MOS 2001.248) has bones which are around three times longer then the holotype, suggesting an animal around 9 feet long and 3 feet tall. The animal would have lived during the Pliensbachian and Toarcian stages of the Early Jurassic epoch, as the boulder containing the holotype specimen likely originated from a Portland Formation outcrop in Massachusetts. The second referred specimen hails from Connecticut (which may or may not have influenced me to write about this animal) and was described in 1958 (Colbert & Baird, 1958). Footprints of the ichnogenus Grallator are common throughout the Connecticut Valley, and some of them might belong to Podokesaurus or something very much like it, providing a glimpse into the locomotion and behavior of this theropod dinosaur taxon. In Purple: Anomoepus In tan: Batrachopus. Photo by the author, 2015. In the Portland Formation environment, Podokesaurus would have coexisted with a menagerie of other dinosaurs and reptiles, including the prosauropods Anchisaurus and Ammosaurus (Weishampel et al., 2004), as well as the large theropod dinosaur Eubrontes (Dalman, 2012). This formation provides one of the best glimpses we have of the rift valley ecosystems of the Early Jurassic Northeastern US. 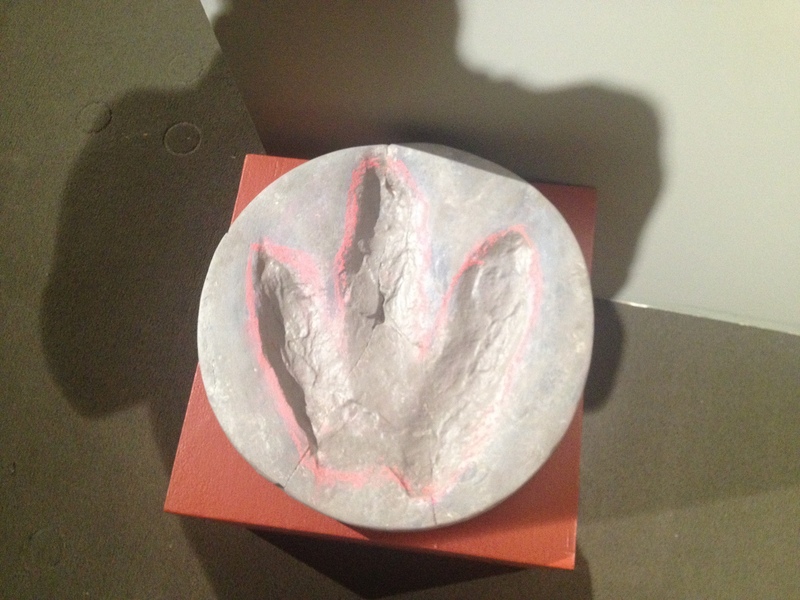 Eubrontes giganteus footprint cast. Photo by the author, 2015. Not only has Podokesaurus extensively furthered our knowledge the dinosaurs of the Eastern US, but the citation of the paper describing it also showcases the name of the first woman to ever describe a non-avian dinosaur (keep in mind that Podokesaurus was described in 1911, almost a decade before the events of 1919-20 which finally allowed women to vote in the United States). In this way, Podokesaurus not only becomes an important animal in understanding the paleoecology of Early Jurassic ecosystems, but also an animal which represents a key time in American history. Podokesaurus holyokensis by the author. Pencils on paper, 2015. 1. Talbot, M. 1911. “Podokesaurus holyokensis, a new dinosaur of the Connecticut Valley.“ American Journal of Science 31: 469-479. 2. Tykoski, R.S. & Rowe, T. 2004. “Ceratosauria.” In Weishampel, D.B., Dodson, P., & Osmolska, H. (eds.) The Dinosauria (2nd Edition). Berkeley: University of California Press. pp. 47–70. 3. Turner, S.; Burek, C.; Moody, R.T. 2010. “Forgotten women in an extinct Saurian ‘mans’ World.” In Moody, R.T.; Buffetaut, E.; Martill, D.; Naish, D. (eds.) 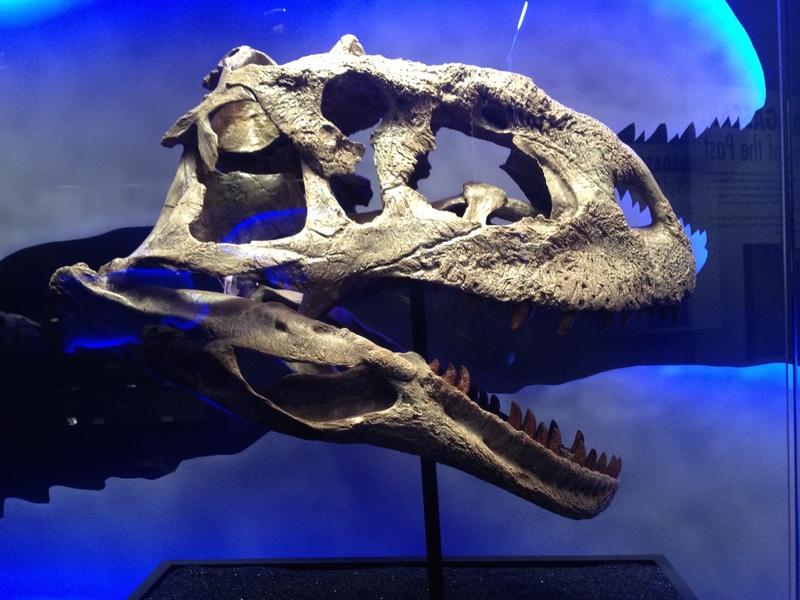 Dinosaurs and Other Extinct Saurians: A Historical Perspective. The Geological Society of London Special Publication 343: 111-153. 4. Colbert, E.H. & Baird, D. 1958. “Coelurosaur bone casts from the Connecticut Valley Triassic.” American Museum Novitates 1901: 1-11. 5. Weishampel, D. B. et al. 2004. “Dinosaur distribution (Early Jurassic, North America).” In Weishampel, D. B.; Dodson, P.; and Osmólska, H. (eds. ): The Dinosauria (2nd Edition) Berkeley: University of California Press. pp. 530–532. 6. Dalman, S. G. 2012. 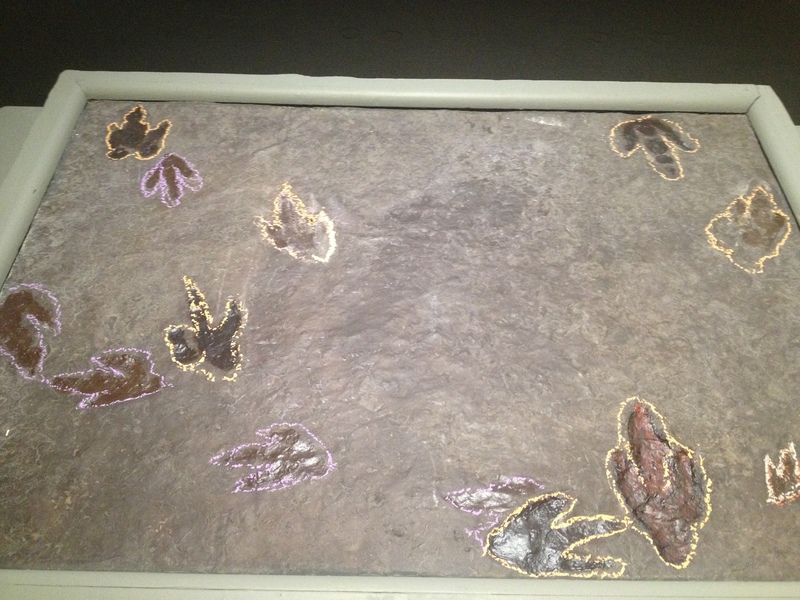 “New Data on Small Theropod Footprints from the Early Jurassic (Hettangian) Hartford Basin of Massachusetts, United States.” Bulletin of the Peabody Museum of Natural History 53(2): 333-353. The forest seems to whisper as the dry season pours into the land, stripping trees of their leaves and animals of their color. We’re in Cretaceous Brazil, and the land is dominated by forest. In these woods, every animal must fight to survive, from the smallest of fishes to the largest of dinosaurs. One animal in particular is suffering from the dry climate. The animal in question is an old Irritator bull. The animal is already at a disadvantage, having lost part of his left arm in a battle with another spinosaur. The wound has become infected, and the old bull’s immune system is not presently strong enough to fight off the bug. For now, the bull must rest and hope for better weather. Unfortunately, another predator has set its sights on the spinosaur, and not as a rival, but as food. A month passes, and the old bull’s health has improved. The infection, however, has taken its toll on the animal, and the Irritator has become weak. He must find food or die. In the corner of his eye he spots movement. He moves closer, and observes a small coelurosaur chasing a juvenile pterosaur. This is Mirischia asymmetrica, the most common predator in these woods. The small coelurosaur, noticing the gigantic spinosaur, hisses and spreads its frill of feathers, which are colored bright blue to daze predators. The little tetanuran darts into the bushes. The spinosaur, knowing not to expend lots of energy on such a small catch, lumbers away. He’ll have to wait another day to eat. Mirischia asymmetrica is a tyrannoraptoran from the Cretaceous of Brazil. This coelurosaur was assigned to compsogathidae (Rauhut et. al., 2010), a group of small, gracile meat eating dinosaurs. In fact, Mirischia asymmetrica is the only known compsognathid from the Americas. That depends on whether Mirischia is actually a compsognathid. 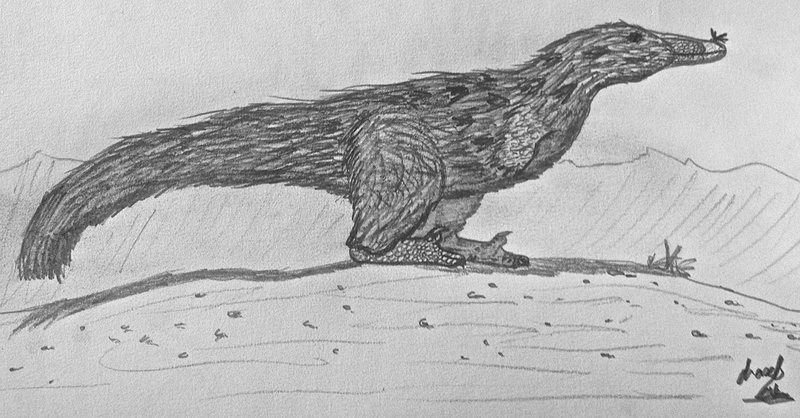 In his book Tetrapod Zoology, Darren Naish suggested that M. asymmetrica might be a tyrannosauroid. Of course, this idea has been explored by the wonderful community of paleoartists. Mirischia most likely hails from the Santana Formation of Brazil (Martill et. al., 2000), and, if so, would have shared its environment with many other archosaurs, including the spinosaurid Irritator (Weishampel et. al., 2004). This spinosaur may have been the apex predator of the Santana ecosystem, while smaller predators like Mirischia foraged for prey on the forest floor. Another small theropod, Santanaraptor, also called the Santana Formation home (Weishampel et. al., 2004). In time, the ancient forests of South America would loose the bloodline of Mirischia as other predators colonized the landscape. During the Cenomanian, new groups of theropods started to take the throne of top predator. During the Jurassic and Early Cretaceous, the megalosaurs and allosauroids reigned as the top predators of ecosystems across the globe. During the Late Cretaceous, however, new groups of killer dinosaurs rose up the ranks. To the north, the members tyrannosauroid group, of which Mirischia might belong to (and, if not, was closely related to) developed larger sizes to go after larger prey. 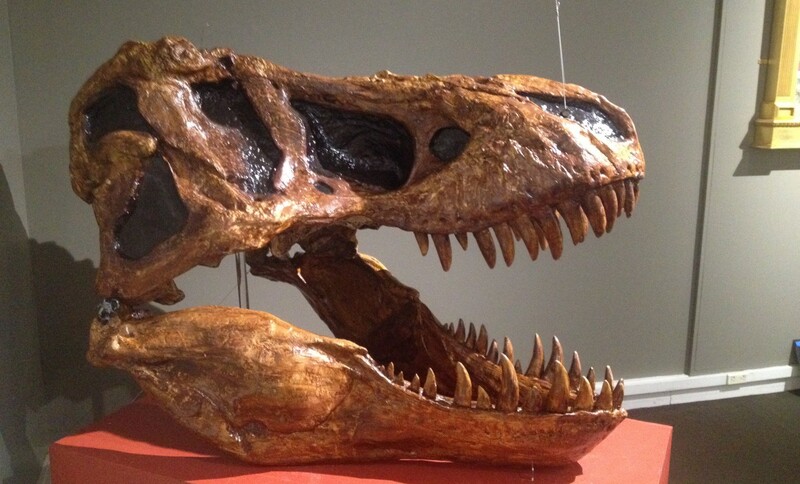 The skull of T. rex, a tyrannosaurid tyrannosauroid dinosaur. Photo by the author, 2015. In the south, another group of carnivorous dinosaurs rose to the top. These were the abelisaurids, relatives of the Jurassic Ceratosaurus. In the Late Cretaceous, these blunt-faced, stubby-armed marauders would conquer the ecosystems of the southern hemisphere, leaving other large carnivores of other predatory groups few and far between. The skull of Majungasaurus crenatissimus, an abelisaurid. Photo by the author, 2015. In this way, the tyrannosauroids might have been prevented from conquering the south, and the domain of Mirischia fell to a rival group of killer dinosaurs. Mirischia by the author. Pencils on paper, 2015. 1. Rauhut, O. W. M.; Milner, A. C.; Moore-Fay, S. 2010. “Cranial osteology and phylogenetic position of the theropod dinosaur Proceratosaurus bradleyi (Woodward, 1910) from the Middle Jurassic of England.” Zoological Journal of the Linnean Society 158(1):155-195. 2. Naish, Darren. 2010. Tetrapod Zoology Book One. Bideford: CFZ Press. p. 235. 3. Weishampel, D. B; Dodson, P.; Osmólska, H. 2004. “Dinosaur distribution (Early Cretaceous, South America).” In: Weishampel, David B.; Dodson, Peter; and Osmólska, Halszka (eds. ): The Dinosauria, 2nd Edition, Berkeley: University of California Press. Pp. 563-570. In light of a recently discovered short-armed dromaeosaur, this friday we will check out another short-armed member of the family. Enter Mahakala omnogovae. 75 million years ago, and Mongolia is covered by dry, somewhat barren plains intermingled with small forests, oases, and lakes. As a group of Pinacosaurus wander by a small forest, a male Velociraptor tries to attract mates using his colorful plumage. Suddenly, something catches the Velociraptor’s eye, and curiosity gets the better of him. He starts to jog toward the small theropod, which, in response, dashes away faster then the male Velociraptor can run. The male Velociraptor, somewhat depressed on not catching the theropod, a Mahakala, trots back to his post to continue his courtship display. Meanwhile, the Mahakala dashes along the dry forest floor, searching for a meal. Suddenly, the Mahakala spots a small lizard, and slowly creeps toward the reptile. The Mahakala strikes and catches the lizard. It will be enough to sustain the dinosaur for the day, but soon hunger will require the animal to hunt again. At approximately seventy centimeters long (Turner et. al., 2007), Mahakala was no giant predator. Mahakala was also found by Turner et. al. (2007) to be the most basal known dromaeosaurid. This animal is known from a partial skeleton, including portions of the skull (Turner et. al., 2007). As it turns out, the holotype represents what was either a young adult or a near-adult Mahakala. This was a mini-dromaeosaurid, indeed! It is certainly possible this animal went after small prey such as insects, arthropods, and small lizards. I imagine the small dromaeosaurid darting across the ancient Mongolian landscape, snatching early wasps and the like from the ground, like a sort of ancient land-bound American kestrel. Mahakala might have also fallen prey to the larger dromaeosaurids and troodontids it co-existed with, including the famous Velociraptor and Saurornithoides. The iconic skull of Velociraptor mongoliensis at the American Museum of Natural History. Photo by the author, 2015. 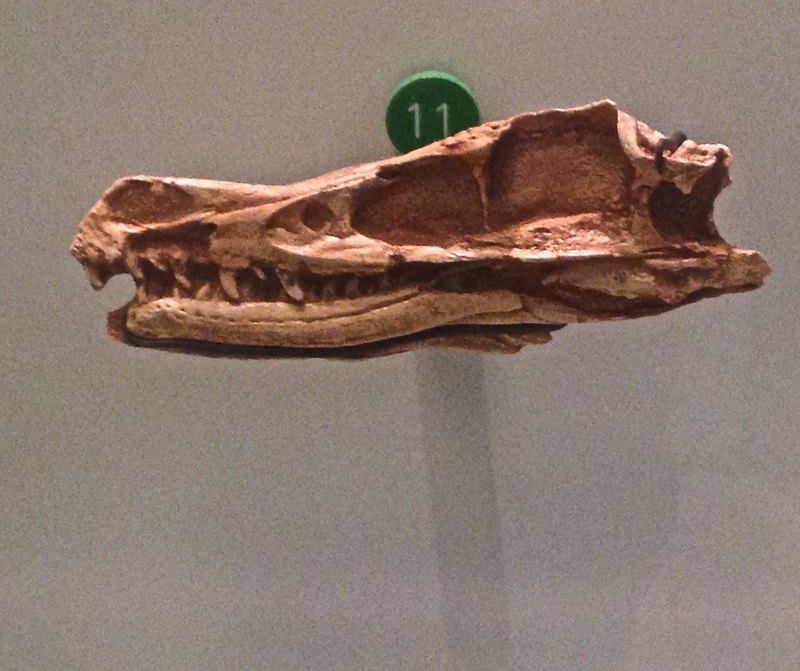 Holotype skull of Saurornithoides at the American Museum of Natural History. Photo by the author, 2015. Yet, as with almost every animal to have existed on Earth, Mahakala succumbed to extinction. The dromaeosaurids themselves would survive for around another 10 million years, when, during one of the largest extinction events in Earth’s history, an asteroid hit the planet we call home, causing drastic global environmental changes and damage. Mahakala itself would be remembered by the specimen of a young adult, locked away in a tomb of sandstone. Mahakala omnogovae by the author. Pencils on paper, 2015. 1. Turner, A. H.; Pol, D.; Clarke, J. A.; Erickson, G. M.; Norell, M. .2007. “A basal dromaeosaurid and size evolution preceding avian flight.” Science 317(5843): 1378–1381. During the Late Cretaceous, what is now the continent of Europe was split into a multitude of islands where both plants and animals evolved into weird and wonderful forms. Unlike anywhere else in the northern hemisphere during the Late Cretaceous, these islands were home to abelisaurids like the french form Arcovenator, which most likely took up the niche of top predator in its ecosystem. The skull of Majungasaurus crenatissimus, an abelisaurid. Relatives of M. crenatissimus existed where France is now during the Late Cretaceous. Photo by the author, 2015. Dromaeosaurids are also present on these islands. Among their ranks is the obscure dinosaur Pyroraptor olympius, a Maastrichtian form native to where France is today. 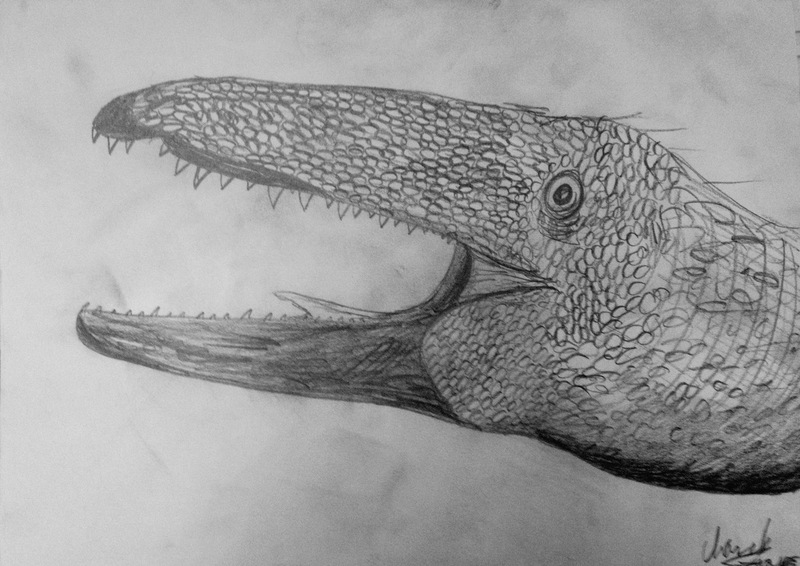 Giant Azdarchids, similar in size to the North American Quetzalcoatlus, also called Late Cretaceous Europe home. Quetzalcoatlus humerus replica at the AMNH. Photo by the author, 2014. Pyroraptor is known from fragmentary remains described by Allain and Taquet in 2000. Because of the fragmentary nature of the specimen, it is hard to estimate the size of this animal, but the bones indicate a length of around 1.5 meters. Since the stocky dragon has been recently reclassified as a basal avalian (Cau, Brougham, & Naish, 2015), Pyroraptor once again is one of only two known dromaeosaurids from the Late Cretaceous of Europe. The other dromaeosaurid is Variraptor, which some consider invalid. Several researchers have suggested that Variraptor and Pyroraptor represent the same animal, which would mean, by the laws of nomenclature, that Variraptor, the older of the two genus names, would take priority. However, Chanthasit & Buffetaut (2009) argued that Variraptor is a distinct taxon, the presence of two morphologically different types of ulna indicating that both of these dromeosaurid taxa are valid. P. olympius would have coexisted with rhabodont and titanosauriform genera, both of which were present in Europe during the Late Cretaceous. The small size of Pyroraptor suggests that it would not have gone after full grown individuals of either group. Rather, it would stick to smaller prey, such as fish, small squamates and amphibians, eggs, and possibly infant dinosaurs. 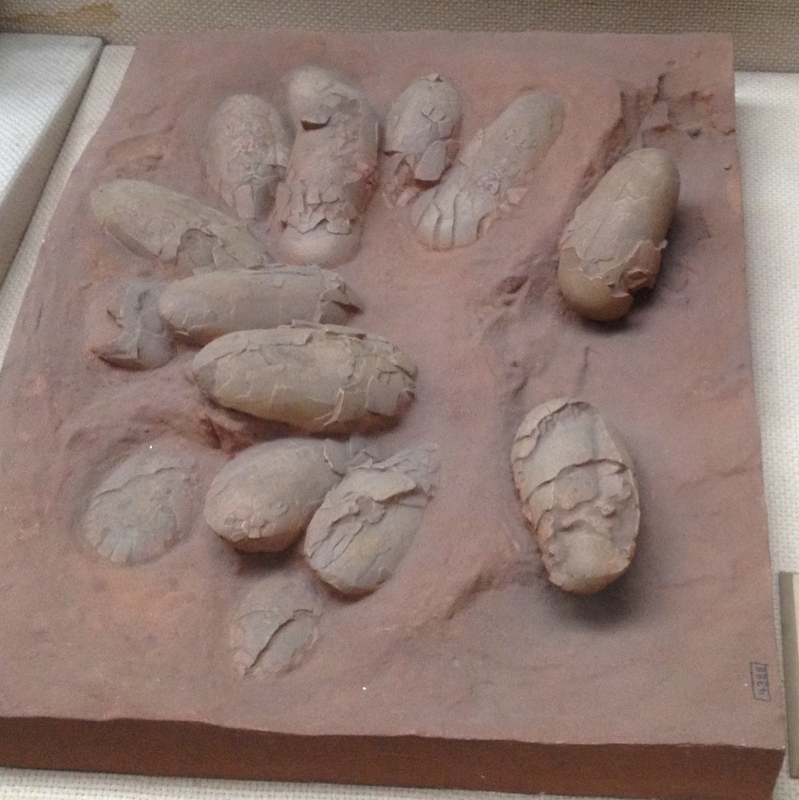 Dinosaur eggs, a favorite snake of Pyroraptor’s. Unfortunately, the eggs pictured come from Mongolia, and so Pyroraptor would never get a chance to eat them. While abelisaurids and azhdarchids ruled the roost as top predators, Pyroraptor scurried across the forest floor, perusing the leaf litter for its next potential meal. 1. Allain, R.; Taquet, P. .2000. “A new genus of Dromaeosauridae (Dinosauria, Theropoda) from the Upper Cretaceous of France.” Journal of Vertebrate Paleontology 20: 404-407. 2. Cau, A; Brougham, T; Naish, D. .2015. “The phylogenetic affinities of the bizarre Late Cretaceous Romanian theropod Balaur bondoc (Dinosauria, Maniraptora): dromaeosaurid or flightless bird?” PeerJ 3: e1032. We have reached the tenth addition of Terrific Tetanurae! 300 views in May and now this! That’s awesome! Thanks everyone for your continuous support, and enjoy the article! 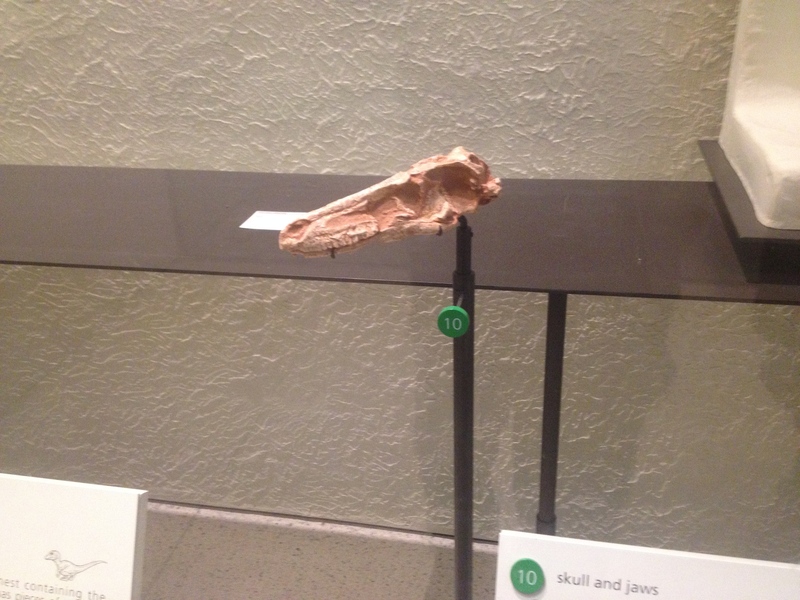 Remember the post on Mark Witton’s blog I linked to in the last addition of PaleoNews? Well, the second addition of that art showcase has since come out and got me thinking with Dr. Witton’s mention of the presence of basal tetanurans in the supergroup. I’ve done some snooping, and it turns out the subject of basal tetanurans in the Wealden Supergroup is quite interesting. Like the Cretaceous fauna of the east coast, which is one of my primary research subjects, much of what we know about the fauna of the Wealden Supergroup is based on highly fragmentary remains. Sure, occasional gems like the mostly complete skeletons of Neovenator, Baryonyx, Eotyrannus, and Iguanodon are incredibly important to our understanding of the paleoecology of the environment the supergroup represents, but more fragmentary specimens like that of the “Ashdown maniraptoran” also tell us a good deal. The tetanuran I will discuss today was described by Benson et. al. (2009), and from what we can tell, it was pretty big. This animal hails from the Wessex Formation (Benson et. al., 2009), where it coexisted with the tyrannosauroid Eotyrannus (Hutt et. al., 2001). You would probably think this animal an allosauroid if you only heard “large basal tetanuran from Wessex Formation.” Yet, the specimen differs a good amount even from Neovenator (see this post by Darren Naish for information on the differences between this theropod and Neovenator), supporting the animal’s status as a basal tetanuran outside of Allosauroidea. The presence of this animal in a terrestrial ecosystem from the Early Cretaceous is unusual, as during this time allosauroids like Acrocanthosaurus were the most common large predators on land. The presence of this theropod in the Wessex Formation shows that the environment it represents could support multiple medium-sized and large predators (Benson et. al, 2009, Hutt et. al., 1996). Overall, this indeterminate tetanuran shows how much we can learn about the paleoecology of a formation from fragmentary specimens. This theropod, at its heyday, would have taken up a predatory niche, hunting the various ornithopods and sauropods of the formation. The Early Cretaceous, however, would be the only time this animal would thrive. Along with the giant allosaurids of the Early and mid-Cretaceous (~145-90 MYA), this tetanuran would be replaced by the larger abelisaurids and tyrannosauroids of the Late Cretaceous, such as Carnotaurus sastrei and Tyrannosaurus rex. Large tyrannosauroids, like T. rex, replaced the large basal tetanurans and allosaurids of the Early and mid-Cretaceous as top predators during the Late Cretaceous. Photo by the author, 2015. 1. Benson, R. B. J.; Brusatte, S. L.; Hutt, S.; Naish, D. 2009. “A new large basal tetanuran (Dinosauria: Theropoda) from the Wessex Formation (Barremian) of the Isle of Wight, England.” Journal of Vertebrate Paleontology 29: 612-615. 2. Hutt, S.; Naish, D.; Martill, D.M. ; Barker, M.J.; Newbery, P. .2001. “A preliminary account of a new tyrannosauroid theropod from the Wessex Formation (Cretaceous) of southern England.” Cretaceous Research 22: 227–242. 3. S. Hutt; D. M. Martill; M. J. Barker. 1996. “The first European allosauroid dinosaur (Lower Cretaceous, Wealden Group, England).” Neues Jahrbuch für Geologie und Paläontologie Monatshefte 1996(10):635-644.